Break the Status Quo. Make a Stronger Ministry. You're ready to shake things up. To help your church embrace change. You won't miss a beat with this all-online graduate program. Our Master of Arts in Church Leadership will equip you with a biblical education firmly grounded in organizational leadership required in today's ministry settings. Identify individual and community gifts, then nurture them to achieve their God-given calling. Become an organizational architect who innovates church structure and inspires spiritual growth. Meet marketplace demand for leaders who can navigate organizational crises and everyday challenges. You'll be prepared for a transformational leadership career, with sought-after skills in motivating teams, strategic thinking, spiritual formation, and corporate and personal ethics. Motivate and mentor your team and to communicate effectively in large, small, formal and informal settings. Apply Christian leadership development practices to guide others with wisdom in church and community settings. Understand the value of strategic thinking and planning to overcome resistance to change. Prepares the student to understand the coaching process, certification, ethics, coach-client relationships, and to develop a biblical worldview of coaching. The course is one of three courses (LDRC 501, LDRC 502, LDRC 503) that comprise the concentration in Coaching and is constructed to align with the academic requirements outlined by the International Coach Federation (ICF) portfolio certification track. ICF certification requirements are posted at www.coachfederation.org and require a combination of direct training and mentoring, coaching experience, and other items to receive certification. Prepares the student to interact with the coaching client to create awareness of issues and alternatives, design coaching interventions, help the client begin the process of change and help the client monitor progress against goals that were defined in the coaching process. The course is one of three courses (LDRC 501, LDRC 502, LDRC 503) that comprise the concentration in Coaching and is constructed to align with the academic requirements outlined by the International Coach Federation (ICF) portfolio certification track. ICF certification requirements are posted at www.coachfederation.org and require a combination of direct training and mentoring, coaching experience, and other items to receive certification. Prepares the student to build a coach-client relationship with leaders through the use of interpersonal communication. In addition, this course helps the student conduct a feasibility analysis in preparation for starting a coaching consultancy or improving an existing consulting operation. The course is one of three courses (LDRC 501, LDRC 502, LDRC 503) that comprises the concentration in Coaching and is constructed to align with the academic requirements outlined by the International Coach Federation (ICF) portfolio certification track. ICF certification requirements are posted at www.coachfederation.org and require a combination of direct training and mentoring, coaching experience, and other items to receive certification. An understanding of leadership from the wisdom literature from the evolution of leadership/management thought from 1900 to the present. Leadership as a contingent/context-specific application and organizational problems that have leader- follower interaction as a cause. Provides an understanding of organizational structure and organizational life-cycle development. Students learn the role of the leader as an organizational architect. The course examines the role of the Organizational Development (OD) specialist and how leaders intervene in their own organizations, as well as how consultants intervene in other organizations. Explores the psychological contract between leader and follower that takes any of many forms between two people or between the leader and small groups. Students study group formation and group development, as well as the intricacies of coaching, mentoring, and discipling. Students study organizational behavior and explore how OB concepts affect leadership effectiveness. Examines organizational communication, including dyadic, small group, formal and informal communication, as well as the relationship of communication to organizational satisfaction and effectiveness. In addition, students study how communication defers in leader-member exchange and mass-communication of charismatic leader/large group interaction. Compares and contrasts strategic thinking with strategic planning and presents the value of both. Students study the leader’s role in organizational change – creating and preventing change, as well as determining the organization’s readiness for change. In addition, students explore the reasons for resistance to change and strategies for coping with resistance. Synthesizes the knowledge and skills learned throughout this program. This experience may be, but is not limited to, a guided project, (i.e., designing a new organization, analyzing an existing major organizational problem and recommending solutions or developing and testing a seminar), a master’s thesis or a publishable manuscript. Prerequisite: permission of instructor. Strategies for effective emotional and spiritual healing in the unique context of the Church. Presents models for biblically based, spiritually-gifted strategies to address key issues as an integrated part of the mentoring and disciple-making process. Examination of effective ways to administrate the local church, including the role of lay leadership. Attention will be given to budgets and facilities, with a view to ministry opportunities. Prerequisite: SFRM 501. Prerequisite: PMIN 501 or concurrent. Cross-listed with DLDR 762 and RTCH 762. Online tools ranging from website development, blogging, social networks, audio/video streaming and email newsletters. Students learn to integrate digital online media content for ministry settings such as pastoral ministry, worship, evangelism, missions, marketplace ministry and others. Cross-listed with DLDR 760 and RTCH 760. Engages existing Servant Leadership models and theories within the context of both leadership and followership. Cross-listed with LDSL 771. Seeks a thoughtful engagement of how Servant Leadership works in a contemporary world regarding issues such as social movements, social corporate responsibility, justice & humanity. Cross-listed with LDSL 772. Studies the biblical foundations, perspectives, and examples of Servant Leadership contained in Scripture with a focus on current application. Cross-listed with LDSL 773. Hold a bachelor’s degree from a regionally accredited institution or an equivalent degree from a foreign institution, as evaluated by a credential evaluating agency. *Rates are subject to change at any time. 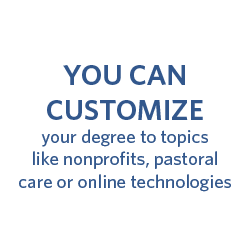 The per-credit-hour tuition rate is for SBL master's-level courses only. Concentration courses taken from other Regent schools are charged at that school's tuition rate.